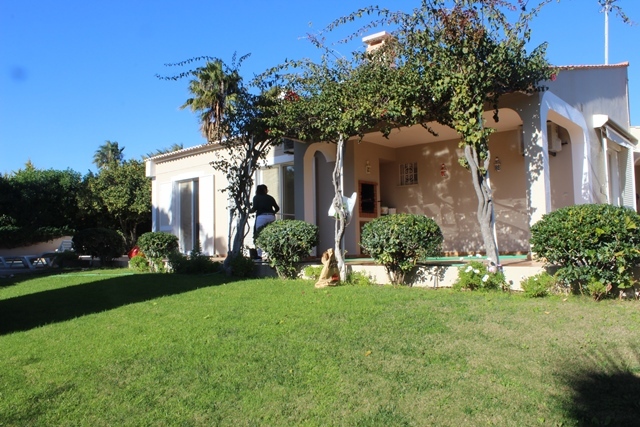 A very well maintained 4-bedroom villa with pool between Almancil and Vale do Lo - Property for sale. Full Description: A very well maintained 4-bedroom villa with pool between Almancil and Vale do Lobo. About 10 minutes drive to the beach and close to the golf courses of Quinta do Lago and Vale do Lobo. Entrance hall Living-dining room with wood burning stove & sliding doors to terrace & pool terrace Fully fitted open kitchen 4 Bedrooms 4 Bathrooms [3 en-suite] Laundry Air conditioned Alarm system Shutters Heated pool 6m x 3m Sat TV Barbecue with dining terrace Garage Parking area Landscaped garden with irrigation Mains electricity & water + water from a borehole Large basement with separate entrance with garage, game/fitness room, extra room and a wine cellar. Could be used as separate apartment.